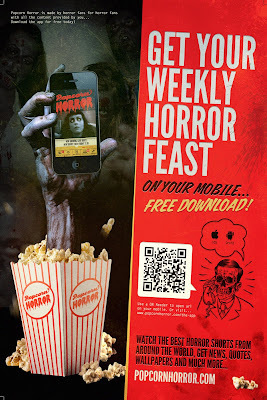 Popcorn Horror, mobile phone app is a bite sized, horror, cinema experience in the palm of your hand. The ever mutating weekly content is user generated and includes the best short horror films from across the world, news, quotes, and much, much more. You can download the app for free on Android, iPhone and iPad. We have an in app purchasing option for people wanting more content. 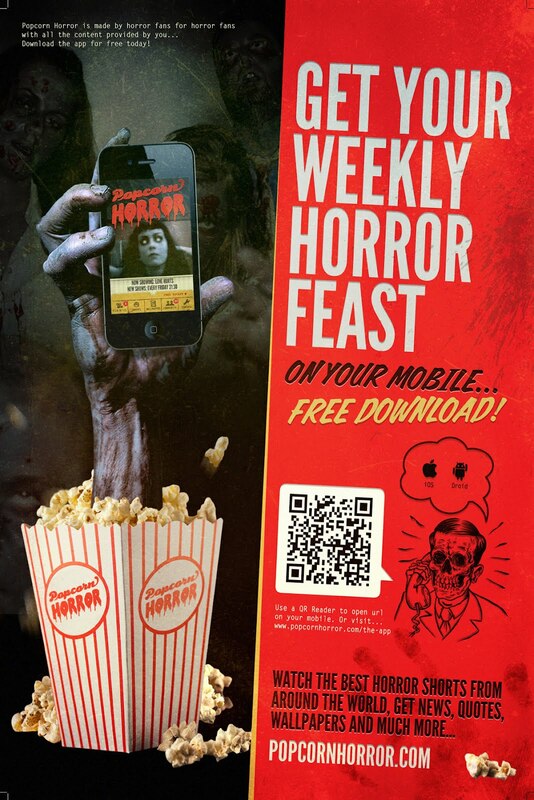 The app was set up not only to provide a horror thrill on the move but also to find away to create an economy that supports independent filmmakers. Popcorn Horror, is one of only a few companies that pays for short film content and looks to be part of a new generation of businesses that finds ways to create meaningful and sustainable relationships between audiences and content creators in an era of mass and open source content. Popcorn Horror has been selected as a finalist for the Flurry 2012 Spotlight award. They were impressed by our design, interface and commitment to supporting grass roots filmmaking. Popcorn Horror, is the brain child of Felix Gilfedder an independent filmmaker from Edinburgh,Scotland. Making his first films after picking up his fathers Super 8mm Cassette camera at the age of 8, there was no going back.From there via a Masters in History, a stint at Sydney University doing Digital Film, making 10 independent short films and a few film awards he decided to try and blend his love of films, horror and technology on the mobile phone platform.